When I heard the news Friday that Grandpa had died, I just had to write. I couldn’t not. We were in the car, en route to Nashville for Hutchmoot, and I cried and wrote. What I wrote, I shared at the funeral yesterday and am posting here also. One might look at Grandpa’s life and declare it narrow. He lived on the same (small, by today’s standards) piece of land nearly all his life. Many of the things we may consider normal aspects of daily life he never experienced. But I will not define his life by what he lacked. His love was huge. He kept up with the world’s happenings and could talk easily with anyone. He placed others before himself. Life didn’t end up exactly how he’d planned and dreamed. But still he saw the silver lining. He served his country, but like most of his generation he didn’t talk much about the gruesome things he doubtless saw. He did like to share about the places he went, though. He saw the world in World War II. Whether based in actual events or fictional, long or short, tall tales or more realistic. Serious or just for fun. He loved a good yarn. He told stories. He read to us. He read books himself. He watched old movies and the news. Uncle Billy is always ready with a joke. He treats his telling of jokes like a job of sorts, placing all kinds of pressure on himself to find and deliver the best of jokes. Uncle Billy isn’t actually anyone’s uncle, but in a way the whole community leans on him. Besides his jokes, Billy is known for loving his wife fiercely. It’s perhaps what he’s not known for that’s the most extraordinary, though. He drew. Exquisite drawings that when they came to light lessened the financial burden tremendously. He caned chairs, he carved. And he did all this quietly, without presumption. With no expectation. Uncle Billy reminds me of Grandpa. Life may not be easy, but he brings the smiles. He enjoyed stories both as a recipient and as a purveyor. More than either of those, though, I remember how he created stories — memories — for me. For us. When I was little Grandpa took Luke and I out to a hill and handed us a gun. He’d previously set up cans across the way for us to aim at. When I hit a can with my first shot, he called me Annie Oakley. He took us sledding. He made us toys. He played the squeezebox and sang. He let us into his story, showing us around the farm. 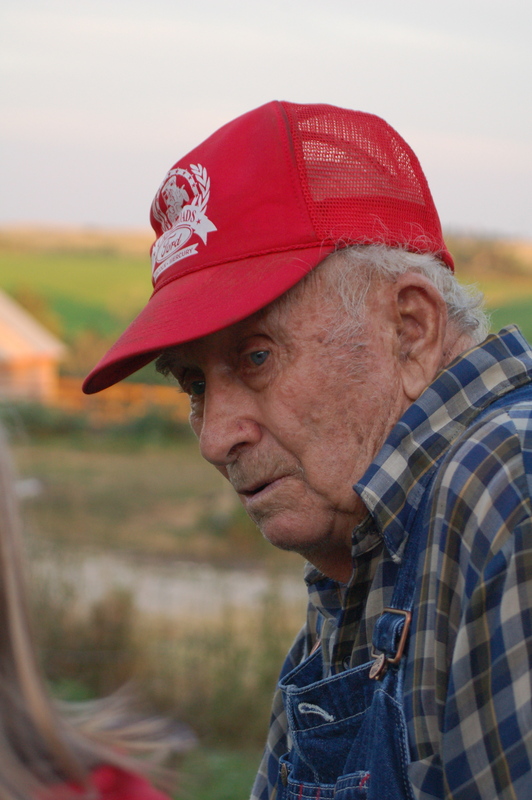 Grandpa loved the land. He delighted in his family. His life was large. This entry was posted in WordLily and tagged eulogy, family, funeral, Grandpa, Hutchmoot, Nebraska. Bookmark the permalink. A heartfelt tribute to your grandfather. He lived life the way he wished it. I pray for his soul to rest in peace and for you to bear the loss. This is beautiful. The true measure of a life, I think, is in how it touched others. Clearly, Grandpa lived a glorious and huge life, and his love for you will ripple out far beyond himself. What a lovely tribute to your grandfather. It sounds like he was a wonderful man. My deepest condolences to you on the loss of your grandfather. Having lost my grandfather just last year, I can empathize with the magnitude of feelings (and especially, the need to write). Like yours, my grandfather was also a WWII vet who didn’t talk much about those days too. Everytime these words are read, they will bring your grandfather to life again in someone’s heart. It is clear he lived well the years he was given. You are so blessed to have this heritage! Hannah, When you read that to me yesterday and then at the funeral service, I thought it was good. Now that I am home and have had time to reread your eulogy, I found myself choked up as I finished. I hope that what I was able to share during the message will add to your family heritage and memories. “Annie Oakley” especially gives me a warm smile. I love you, Dad. *hug* I’m so sorry for your family’s loss. This was a touching tribute to him. So sorry for your loss. What a privilege to be related to this man. What an honor to be able to express your love and respect for this patriarch in your family. I’m so sorry that you are grieving, Hannah. Your eulogy was beautiful – he sounds like an amazing man. What a lovely tribute to your grandfather. Hannah this is a beautiful post. Your Grandpa sounds like he had quite the life and the comparison to the Mitford character is so fitting. My heart weeps for you. You are in my prayers. I’m so sorry to read about your Grandpa. You wrote a beautiful eulogy. I lost the only grandpa I ever knew when I was 21 and I still miss him at times. Especially when I think that my child will never get to meet him. But they live on in us and the stories we tell about them. You are in my prayers. What a lovely remembrance. He would have enjoyed reading this, I think.